What Is an MFA Degree? In most areas of study, students have the option of enrolling in a master's or doctoral program to continue their education. Students interested in the creative arts might consider pursuing a Master of Fine Arts (MFA). An MFA is a two- or three-year program in filmmaking, creative writing, visual arts, photography, graphic design, dance, theater, and other performing arts. It's an applied arts program for students who want to become professional working artists. The vast majority of MFA courses are performance-oriented, rather than equal parts liberal and performing arts. The Master of Fine Arts is not to be confused with the Master of Arts. An MFA is an academic program concentrated on one particular area of study. MA programs are a bit more liberal arts-based by nature, and they include a scholarly study of the subject. In the United States, an MFA is recognized as a terminal degree, meaning it's the highest degree available in a field of study. It's also the minimum qualification in order to become a full-time professor at a college or university in MFA-related disciplines. Master of Fine Arts degrees are offered at institutions around the world, and each has its own specific set of requirements. Most MFA programs require a bachelor's degree in order to be admitted, but many institutions don't require that the bachelor's degree be the same major as the MFA area of study. Unlike other graduate programs, MFA programs don't always require the GRE. Admittance into an MFA program largely depends on the quality of the applicant's portfolio. 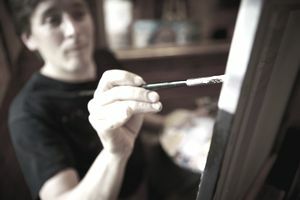 An undergraduate student who is majoring in the arts will assemble a portfolio while working toward a bachelor's degree. Portfolio content varies depending on the area of study. For example, a student wishing to pursue an MFA in creative writing will present a portfolio of writing samples. A student who wants to pursue an MFA in dance, however, will complete a performance audition. There are two different types of MFA programs: low residency and high residency. A low residency program typically involves distance education and brief, face-to-face, on-campus residencies that are held over a weekend or a few times a semester. The online component of low residency programs doesn't indicate a lesser education, however. Low residency programs are becoming increasingly more popular given their flexibility. A high residency ​program, also referred to as a full residency or on-campus program, is held entirely on campus. The intensity of this type of program requires much more of a commitment. There are a number of factors to consider when choosing between a low residency and high residency program. If you've been out of school for a decade and have a career and family, you probably can't pick up and move to an entirely new city to devote 100 percent of your time to an on-campus program. A low residency program might be right for you. But a 22-year-old student who is going to straight from undergrad into an MFA program has significantly more freedom to participate in an intense, on-campus program. Flexible schedules designed for students who have jobs, families and other commitments in addition to going to school. Rooted in distance education and online learning; face-to-face workshops on campus are held on occasion. Admission generally isn't as competitive as on-campus programs; fewer admission requirements. Less intense due to the infrequency of face-to-face classes. MFA degree awarded upon completion of the program. Tuition is expensive and self-financed. Very little to no hands-on graduate teaching experience. Often not as highly regarded as attending a full-time, on-campus program. Typically fully funded; stipends offered for graduate teaching assistants; students can apply for grants. Students have the opportunity to have their work published. Teaching experience is often a key component. Professors and classmates are extremely accessible. Relocation to a new city isn't always an option for some students. The intensity of the program might not allow students to work part-time. Admission is more challenging, particularly for students enrolling straight out of undergrad. It's important to know that both low and high residency MFA programs will advance your abilities no matter which one you choose. Either way, you're benefiting. However, if you are interested in eventually teaching, you might want to enroll in a high residency program that will give you teaching experience and open you up to an entirely new job market.